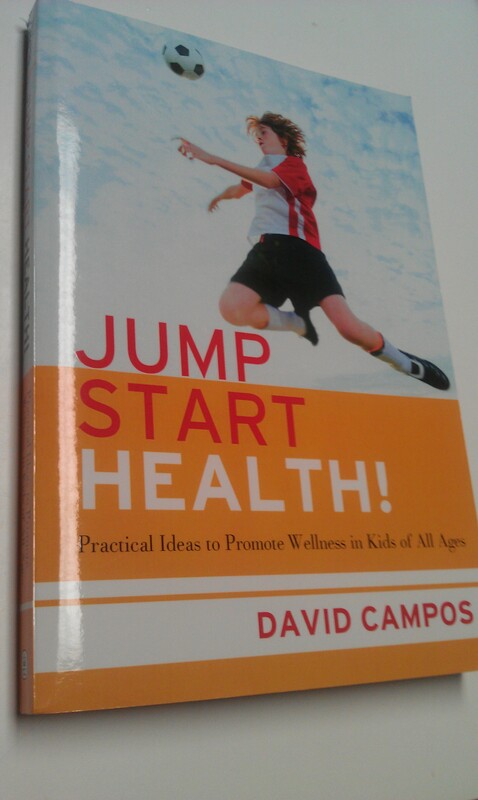 Book review and giveaway: Jump Start Health! A couple months ago I was asked if I’d be interested in reviewing Jump Start Health! by David Campos. I jumped at it (pun intended) as health and wellness have taken on a big role in my life over the past eighteen months. The core audience for this fabulous resource includes both educators, students, and anyone interested in health and wellness. This curricula can be used in lesson planning immediately (if it wasn’t summer). Also I see the book as required or recommended reading for college students studying education or health. Jump Start Health! is divided into three parts. The first part, “Coming to Terms with Childhood Obesity,” discusses obesity, health, and wellness and is packed with information and statistics. I could tweet out interesting health statistics from this book for days. The second part, “Nurturing Healthy Dietary Habits,” starts off defining the health benefits of a variety of foods and then moves into lesson plans with clear objectives and classroom activities around nutrition. Similarly the third part of the book, “Promoting Regular Physical Activity,” offers the rationale for physical activity and then actionable ideas for lesson planning. The final part of the book, “Beyond the Classroom: The School and Community as Channels for Promoting Health,” examines the larger environment outside of the classroom. Jump Start Health! is loaded with ideas for classroom lessons to inspire children and students. It doesn’t read like a dry, boring “textbook.” I have found that educational preparation is often focused more on theory than on practice. What I like about this book is that it is devoted to instructors who care about these issues and are in front of students every day. The publishers are giving away two copies of the book to readers of this blog. To enter to win a copy of Jump Start Health! please leave a comment below. I’ll announce the winners in a week! Would love to read this book, thanks Ms. Q! I would love this as a resource to help me jumpstart my health. I’m making baby steps in increasing my fitness and slowly changing my eating habits. The extra motivation would be great!! As an educator, I love incorporating movement and physical activity in my classroom as often as possible. I’d love the book as an extra tool in my teaching toolkit! You won a copy of the book! Please email me your address! Such an important topic to embrace by everyone! I would love a copy! This sounds like an amazing book and would be great to learn more info! Oh! I would love to win a copy of this book. My husband and I struggle with our weights. My oldest child has heart issues (which make it hard for her to keep weight on) and the younger one loves to eat…so it is tough for us to keep everyone’s needs met. Thanks for posting the review! This sounds like an amazing book… I could see it having both practical applications in my home life as I try to change our eating habits as well as my future students. That would be an interesting book with which to wind up my summer reading! Sounds like a very interesting book chock full of great information! would love to win this book and use it in my classroom and with my kids at home. This book sounds fantastic for teachers, I’d love to read it. Thanks for posting about it! It does look like a great tool for teachers. There should be one in every school! As the mother of six daughters and a wellness-promoting health and physical education teacher, I appreciate your positive review of Jump Start Health! It is now on my list of summer reads. Let’s always remember that parents are their children’s most influential health teachers. All of our coordinated school health efforts must support our families and their positive, healthy practices if we are to successfully avoid the proposed obesity train wreck. The book sounds interesting. I’ll have to see if my local library carries it. I’m a student writing a paper on physical health and dieting! Would love to reference this book and have a copy! This sounds like a pretty interesting book! If I’m lucky enough to win it, I’ll be donating it to my library (though to be honest I’ll be keeping it all to myself for a week or 2), because we are really in need of updated health books right now. of updated health books right now. Being obsese myself and trying to lose weight while setting a good example for 2 toddlers, I’d love to read this book. This book does look really great, I love to read things which help me prepare for being a parent. I feel as though I am getting ready, even though having children is still a few years off – forewarned is forearmed! And I’m interested in health for my own sake too, so it would be great all round.